Who is your most foul and cruel enemy? 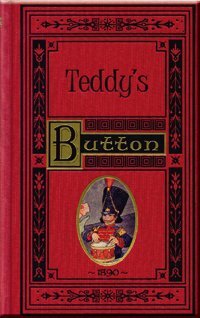 After reading Teddy’s Button, you may have a new answer to that question. Flamboyant Teddy Platt cannot keep silent about the glorious history of his sacred button. Soon this passion brings him into contention with a new little girl in the village. God uses this enmity to bring Teddy to his knees ready to sign up in the Lord’s Army prepared for service in the war against his worst enemy—himself! Are you a faithful servant of the King flying the banner of Love over your life? Teddy has some lessons to teach us all. Enjoyed this book, a great story with a concrete way for kids to understand how to fight the christian battle every day. From Brooke Kindred of Kooskia, Idaho on 7/17/2018 . Hardly damaged! A very handsome copy of Teddy's Button! The story is very charming and filled with truths that little ones can glean from throughout the story. You won't want it to end! From Anonymous of Ashaway, Rhode Island on 8/22/2017 . Read this to my 7yo at bedtime and my 11yo kept sticking her head in to hear despite knowing she will be reading it for school later this year. The 7yo loved the book & praised God for Lamplighter books during prayer. A great book and so pleased to have found books that will instill good character and are open about "our Captian" Christ Jesus for our children.